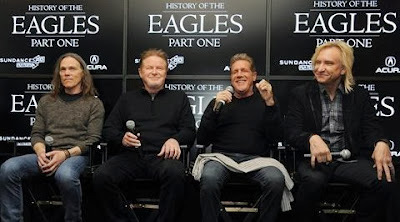 The History of the Eagles Tour has landed in Manhattan for three nights at Madison Square Garden. At this point, nothing can be said of the Eagles but they put on a perfect absolutely perfect, flawless show. The two part show featured a chronological history of the band with the opening set dwelling on the first four albums, an intermission & a second set consisting more of the latter mega FM radio hits, we all grew up on. These hits were mostly from the Hotel California & Long Run albums, with the Joe Walsh material added in as well. 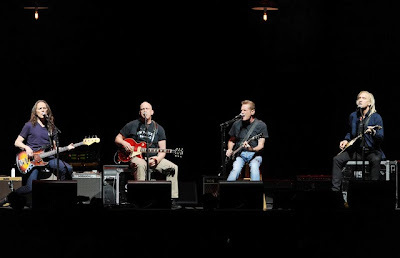 It was a special treat to have original Eagle; Bernie Leadon play the entire first set & part of the encores as well. Leadon the last founding member to join the band, brought his blue grass/ country style of music into the band & into mainstream rock & roll. Leadon was introduced at the shows start, with the band sitting close together, doing early acoustic songs like Saturday Night & Doolin Dalton. The group, (mainly Glen Frey) have still not come to terms with guitarist Don Felder who certainly should be in anything labeled "history of the Eagles". Felder was a member for four studio albums (1974-1980) as well as the Hell Freezes Over reunion in 1994. Once again a hired hand session guitarist plays Felders role, but Felder was certainly missed by many die hard fans. 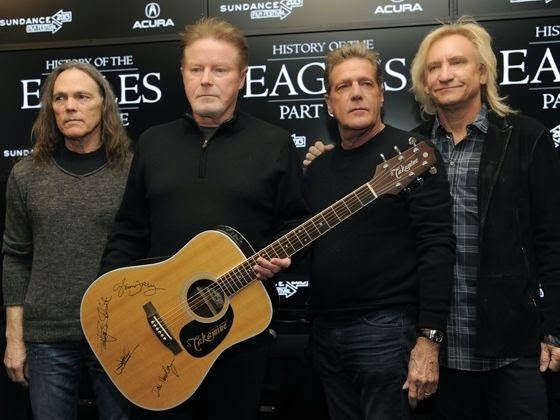 Randy Meisner (an Eagle from 1971-1977) was mentioned, but Frey said he had been under the weather as of late. Frey did a fine job on the vocals to Meisner's Take It To the Limit. Tonight's songs were crisp, digitally clear & are nothing but perfectly covered. All the bands vocals have remained intact, whether it be on a lead vocal or in a harmony effort, these guys are 100% on the money. If anything Don Henley, Glen Frey, Timothy B. Schmidt & Joe Walsh have their voices sounding better than ever. The Music, also fantastic, was nothing less than perfection. Some of the purity gets lost at times, with the backing musicians on stage which seemed a bit much. I wished it was just the main Eagles up there doing their thing, nut that's not a reality with the elaborate stage show. When they did the acoustic sets, early on in the show, it proved the originals needed no extra support from anyone else, these guys are some of the best on the planet in music. Joe Walsh was spectacular with his lead guitar, electronic voice effects, & his lead vocals on his songs. Walsh looks fantastic, maybe as healthy & energetic as I have ever seen. He gave us the classic "how ya doing" after an elaborate introduction, only maybe Henley got a louder ovation. Walsh went into performances that provided the hardest rocking in the show, as well as some of the biggest crowd pleasers. Only the Eagles can go from the Walsh rockers (Rocky Mountain Way, Funk 49, Life's Been Good) to the county rock (Take it Easy, Peaceful Easy Feeling) as well as the classic mellow Eagles love songs (Best of My Love, I Can't Tell You Why, Desperado). Thrown in the legendary classics (Hotel California, Life In Fast Lane) & you have your self one hell of a show. 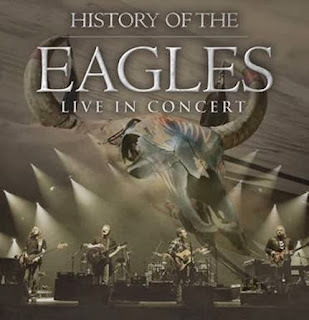 This show was different than Eagles shows of the past years, as it featured no solo songs from Henley & Frey. It was all Eagles, celebrating their history with the Walsh stuff thrown in. 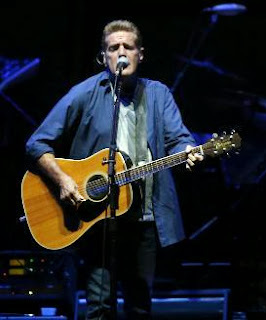 Glen Frey, who still looks very dapper, yet raw as well as tough. He is shorter than the other band members & as he hunches over while playing, gives off a now classic image of himself today. His attitude is still there, as he proved early on, when he scolded a fan in the first few rows for texting. He even joked about his now famous ego, like when he was introduced by Timothy B. Schimidt & was seen fixing his hair jokingly in a mirror. Another funnt take on himself was when he said, he had brought a new song to the band & as usual they loved it (tongue in cheek). 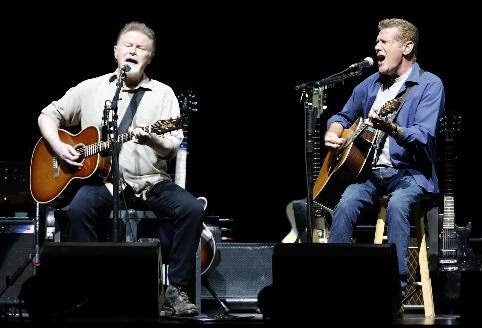 Don Henley, who has emerged as a superstar singer, songwriter, multi instrumentalist rock star legend, seems more loose in his older days. To me he seemed more laid back in his flannel shirt & very casual. He sports short red hair pushed back, with a new full grey goatee beard. Henley's voice is still amazing & he can still do with that special edge he has on his great lyrics. He played the drums most of the night & also played on percussion. I feel Henley's fine drum playing always gets overlooked because of his fantastic voice. Not to get unnoticed, the mellow Timothy B. Schmidt, as thin as ever still sports his long hair & looks very youthful. 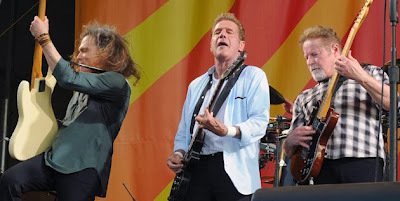 All I can say is that this was an excellent show, the highlights for me were; Those Shoes (from the Long Run) which I never seen them do before, arguably my favorite Eagles tune. Lying Eyes, just one of the best songs ever made, Life In the Fast Lane, which was a theme of life & a party song back in my heyday. Also Joe Walsh's; In the City is always special, especially for those of us who are fans of the Warriors movie, where the song was featured.